All societies produce some overly paranoid beings. Their critical thinking is perhaps, too critical. Too critical of even the concept of logic itself. I thought the janitor would be more grounded. RR: Hi! I’m doing interviews for an article about Vault 88’s residents. So far it’s been… Strenuous. But enough about that. I heard you’re the janitor around here. Jones: She calls me a Custodian, but I know it’s just an inflated title to keep me content, by giving me a false sense of importance. She wants to keep me ignorant, like all the other brainwashed vault rats. RR: I’m starting to get the same feeling. Do you have any thoughts on what techniques are used to manipulate them like this? Jones: Via the food and water supply. Jones: They put mind altering chemicals in the water supply and food. I don’t eat their food without marinating it in irradiated water for 48 hours first. All liquids they serve, like tap water, O.J. and beer, I rinse through a rusty filter from the outside. It works! It’s scientifically proven. RR: Really? I’m not sure if – oh, what the hell… By whom? Jones: I’ve done tests, and read on a terminal around here about a guy who got free of the tyranny of Vault 88 by drinking irradiated water. Also, look at me. I’m just fine. I’m actually feeling better than everyone else around here. RR: A conspiracy like that takes a lot of people to work. Who are these “they” you speak of? Jones: Vault-Tec! They’re doing experiments on us. They’re behind the whole thing. Diversion. Fear of the outside. Mass control. Everything. Only reason we’re alive is to test out their sick scenarios, mostly involving product-testing before full-scale launch. RR: Vault-Tec started a nuclear war to test out products they could sell. Checks out… Didn’t Vault-Tec die out with the bombs? Jones: Nope. That’s a rumor put out there by Vault-Tec to keep us scared so we will listen to the Overseer and report suspicious activity. Jones: The government kidnap people and switch them out with lifelike, fear mongering robots to reinforce mass suggestion. RR: Didn’t you say Vault-Tec was behind all this? 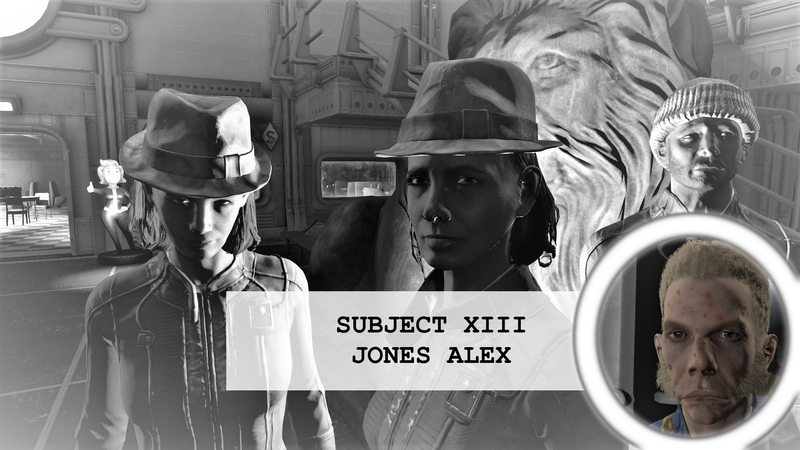 Jones: Vault-Tec is the government, man. They want to keep us from using their weapons against them. You see all the turrets around here? They’re not about keeping us safe. They are there to scare us from rebelling against them. Seriously, it’s fucked, man. RR: Don’t you see how incoherent and far-fetched all of this sounds? RR: That’s it. I’m out. Notes: No more. No more people like this. Paranoia strikes at every echelon of society. I gotta admit, some of what he said made sense. Although… Naw, he’s crazy. Next up, a real ‘serve and protect’-type of guy. The enforcer, keeping people in accordance to the law of the land.